The duct temperature transmitter TDTH is used for sensing the air temperature in heating, ventilation and air conditioning systems (e.g. in supply air, extract air or mixed air ducts). 0 to +40C, 0 to +50C, 0 to +100C and 0 to +150C. Other temperature ranges on request. The power supply for duct temperature transmitter TDTH with 4-20 mA output is 15-36 Vdc and the power supply for duct temperature transmitter TDTH with 0-10 Vdc output is 24 Vac/dc. 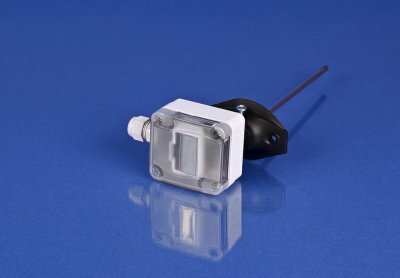 The active duct temperature transmitter TDTH with output 0-10 Vdc and 4-20 mA have a PT1000 sensor (DIN EN 60751, class B). The sensing element for the duct temperature transmitter TDTH is located in the end of the probe. Duct temperature transmitter TDTH have IP65 enclosure. 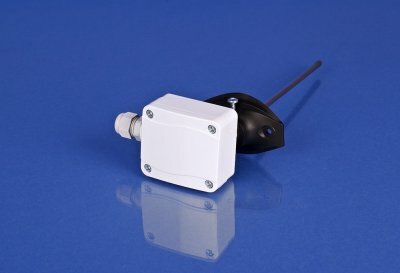 TDC duct temperature transmitter have 4 quick locking screws in the cover of the enclosure. Wiring connection for duct temperature transmitter TDTH is inside the ABS plastic enclosure on a terminal block. TDTH duct temperature transmitter can be supplied with or without LCD display. The probe of duct temperature transmitter TDTH is made of quality steel, standard probe length for the duct temperature transmitter TDHT is 200 mm, on request the duct temperature transmitter TDHT can be supplied with 50, 100, 150, 250 and 300 mm probe lenghts. Duct temperature transmitter TDTH is supplied with a duct mounting flange for fast and easy mounting and for good sealing into the duct. without display will be TDTH 010 150.
with LCD display will be TDTH 420 250D.